Unfortunately we didn't have time to keep updating this record as we went. 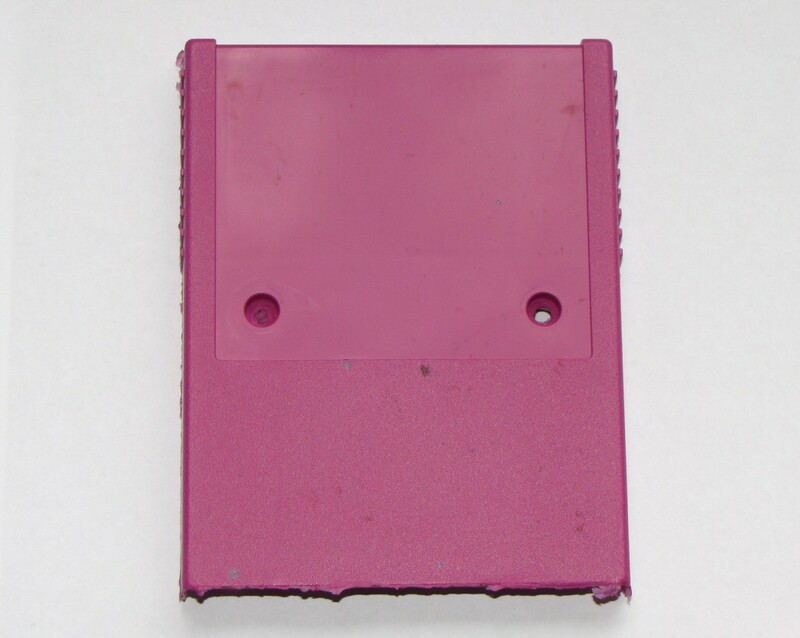 So to cut a long story short, we can now make our own SC-3000 Survivors cartridge cases. All Multicarts now ship with a case. 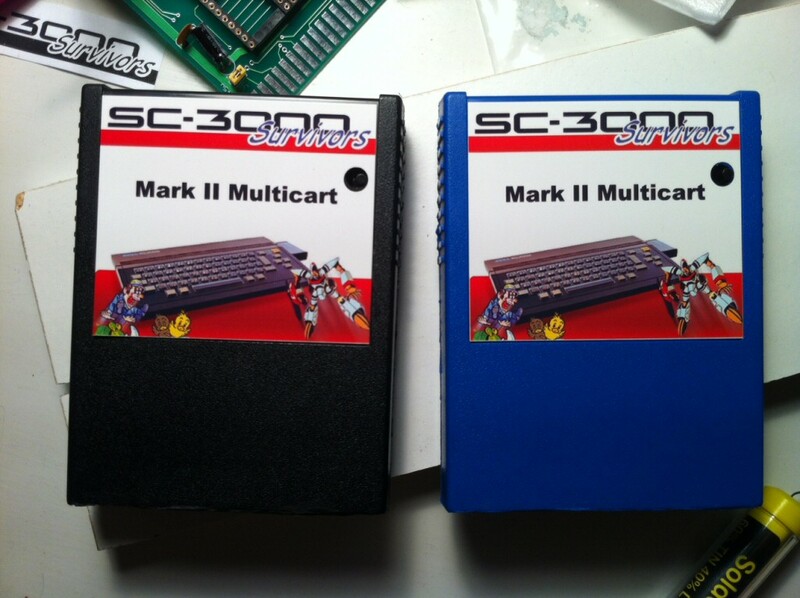 Update: 7 April 2015 : We still have a few spare SC-3000 / SC-3000H multicart PCBs, so you can still order one. Sadly however we are no longer doing the custom cases, so you will have to supply your own (although we do send you a very cool vinyl label for your case). The good news is that we've had a price drop. Now only $85USD + shipping! Check out the cool 3D SC-3000 Survivors logo on the back of the cases. We made a little 3D model and had it 3D printed at Shapeways. Then we glued it to the back of the original cart when we made the mould. 3D Printing is a very cool, awesome technology. You can do amazing things with it and there are now home 3D printers available for $500 to $1000 USD. But unfortunately commercial 3D printing is too expensive (approximate cost per case $65 to $100 USD). The home 3D printers are cheap to run (approximately $5USD in plastic materials per case), but they are slow in high detail mode and the quality and consistency just aren't there yet. Check out the Solidoodle 2 and the Makibox to see how open source designs are being used and modified by small entrepreneurs to bring affordable 3D Printing to the masses. I know there are lots of RepRap projects around, but these are two cool examples of trying to make 3D printing much cheaper and easier. Buying a bulk lot of cheap of games from Japan is the most cost effective option for proper SG-1000 / SC-3000 cases. That probably works out about $7 USD to $10 USD per case by the time they are shipped. But you have the hassle of finding someone in Japan to buy them for you, and it is a shame to kill old vintage games if you don't have to. 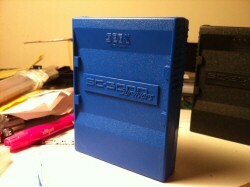 You can actually use Colecovision cases on a SC-3000 / SG-1000 if you design a custom PCB and make a few cuts to the case. We've tried that and the end result is pretty good. But we'd still like a real SC-3000 case if we can. 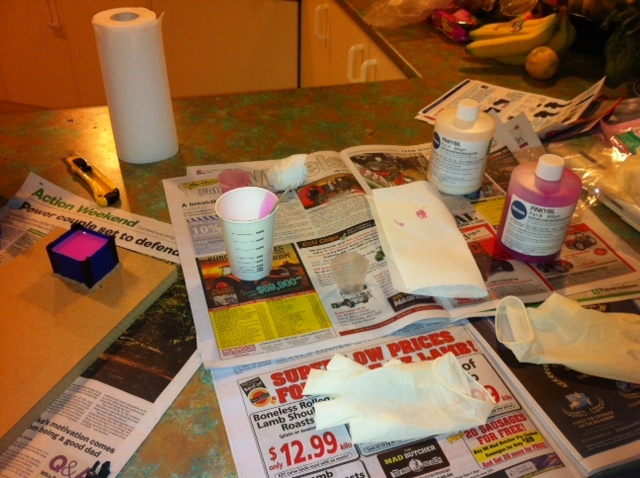 So this project is mostly about silicon moldmaking and resin casting. At this early stage we have doubts that this is going to be viable for any volume of cases. But it sure is fun :) Read on to find out how we are progressing. Hi All! It has been a while so I thought I'd share my latest project - making a silicon mold of a SC-3000 cart case and creating new resin casts. I initially did a pile of research into 3D printing. I really wanted that to work as 3D printing is just amazingly cool. Richard Mayo from Protobuild (3D Printing and Design) was really helpful answering all my stoopid questions. Their quotes were competitive and I'd thoroughly recommend giving them a call if you are in NZ and need a 3D prototype created. When it because obvious the cost would be prohibitive for a low volume / cost hobby project he suggested I try making a silicon mold and pointed me towards the good folk at TopMark Products in Ellerslie. They provide a lot of product to the film industry including the Hobbit and Spartacus. But they are also used to helping out hobbyists and artists and sculptors, so they cater to a wide range of people. I picked up a pile of stuff from TopMark Products on Monday. They were very helpful and gave me some good suggestions - many thanks to Gabrielle and Alastair for their assistance. 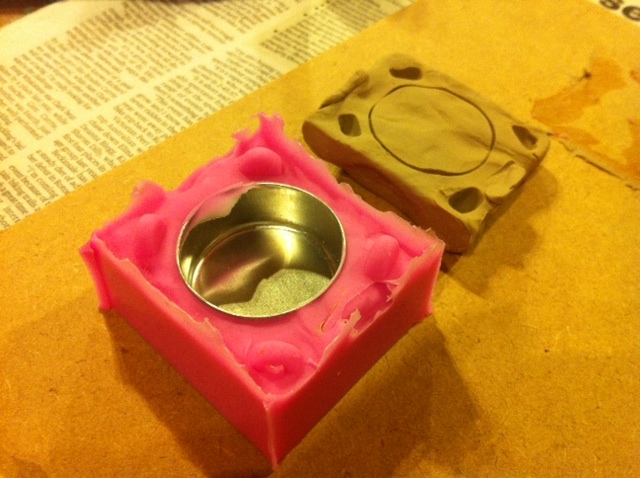 I made my first test mold and cast last night. I'm pretty happy with it for a first attempt and I learned a lot. I needed to try something small, but which would let me test a thin walled object and a plug / squash mold technique. 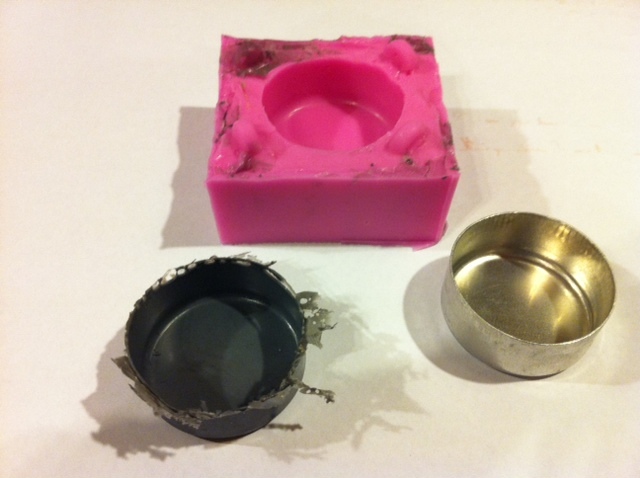 A plug or squash mold is one where you fill the bottom half with resin then insert the top half like a plug and squish the resin into place. This technique is well suited to casting thin walled objects like a games cart case. So I used the solder sponge tin from my soldering iron. The walls on that are only about 0.55mm thick, which is a lot thinner than the cart cases (thinnest wall is approx 0.75mm, most walls 1.8mm to 2mm). mold box, pinkysil mix, tools etc. I'm using Pinkysil, which is a platinum based silicon. 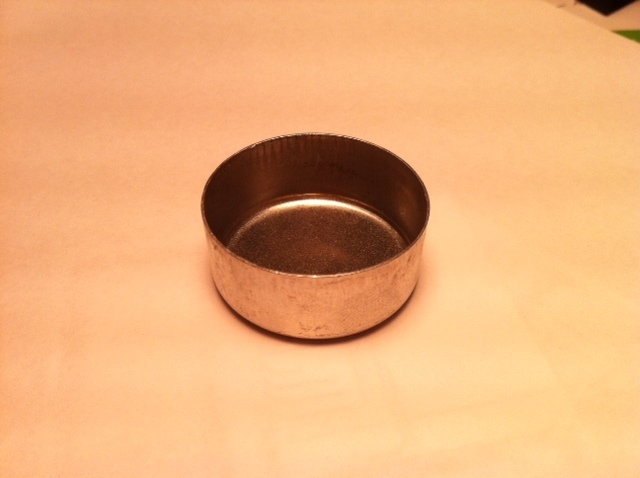 It is thin, pours well, resilient, doesn't need degassing, holds detail well etc. It is also $128 NZD / kg (approx 900 ml) which isn't quite enough for the four mold halves I need, so I don't want to waste it. The soldering tin was small enough to not waste too much silicon. I used about 110 ml of my silicon for this. Here is my work bench. Or the kitchen as my wife likes to call it :) You can see the Pinkysil bottles, mixing cup, and the poured mold (blue with pink inside it at left of screen). Close up of the Mold box. You can't see it, but the soldering tin is upside down embedded into some Klassic Klay. 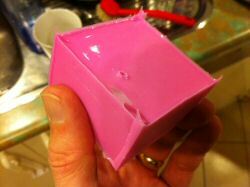 I then used bits of ice cream container to build a Mold box around it. 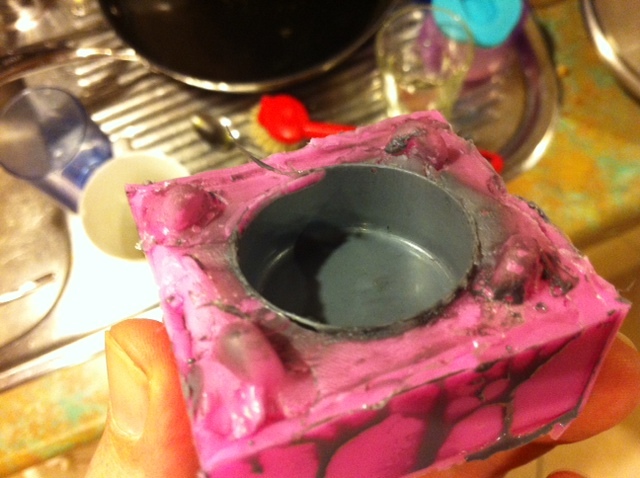 The bottom is sealed with Klassic Klay, then the Pinkysil is poured in. It sets in about 30 mins. First half of the mold has set. I have removed the Klassic Klay which was on the bottom. 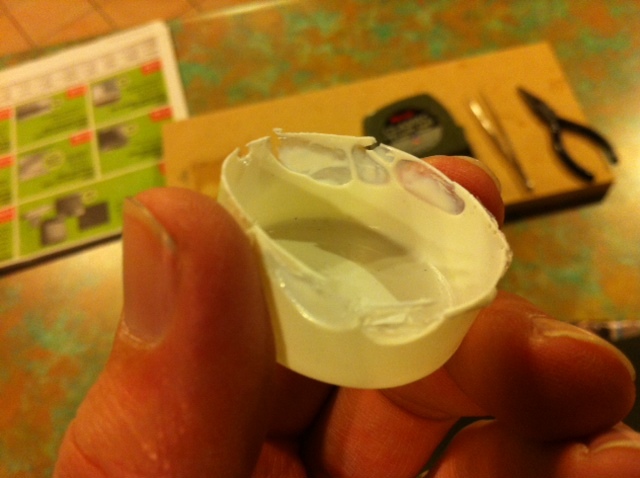 Next step is to cover the first half of the mold in release agent (petroleum jelly). 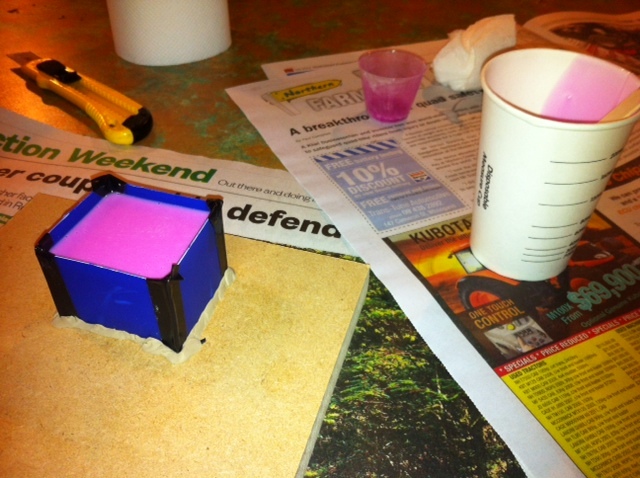 Then flip it over, rebuild the mold box, and pour the second half of the mold. 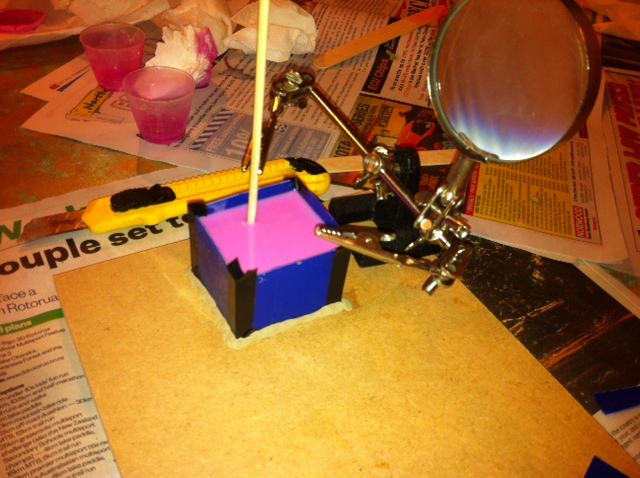 You can see here I'm using a soldering station to leave a sprue or air hole in the top half of the mold. Well, that was the plan. I forgot to set it up before I poured the mold and the silicon started to set before I remembered. So this first pass didn't have air vents. Oops. I will have to try to cut some later. Update - make sure you put plenty of air vents in when you pour the mold because it is very hard to cut clean vents through the Pinkysil later on. 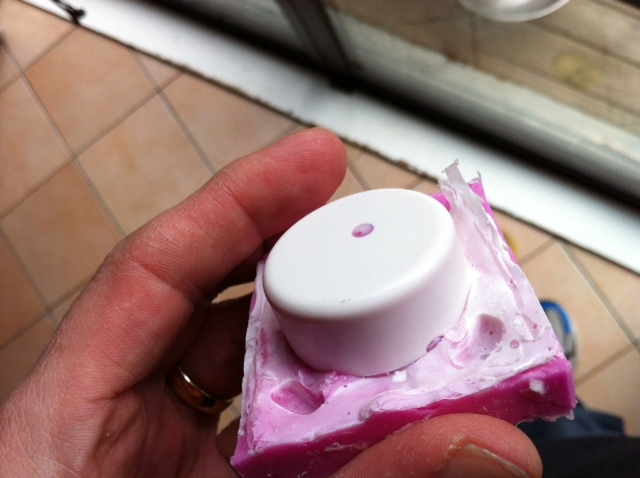 The Pinkysil is soft and cuts easily with a sharp craft knife. But it is almost impossible to drill with a standard drill bit. The drill bit just slides through the silicon without removing any material and when you pull it out the hole closes up. And the silicon has a high melting point, so heating a nail up with a blow torch and poking it through didn't help either. I eventually cut new sprue holes using a scalpel. It doesn't give the neatest hole, but it seems effective. second half of mold set - where is the join? I purposely went light on the release agent because I wanted to see how badly the new silicon would bond to the original silicon. I may just buy one of the release sprays. They are about $30 - $40, but the vaseline was very messy to use and hard to cover the entire mold consistently. That is important, because the new silicon sure does stick to the old one. Second half has dried. Where is the join? The new silicon ran down the sides and completely bonded the two halves. 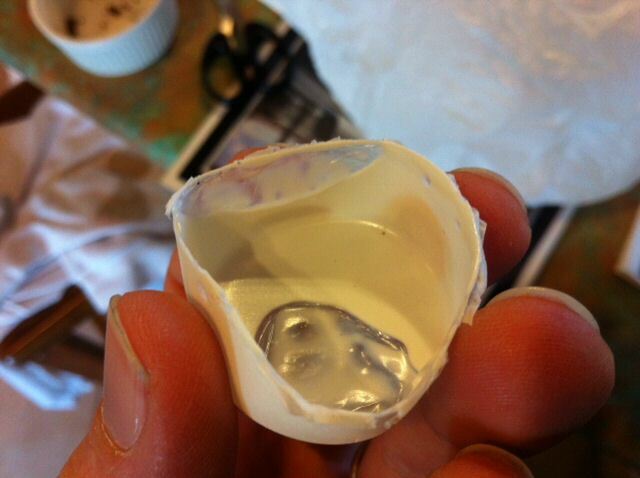 Next time I will spray the entire mold, not just brush the top. Or at least I will seal the sides of the mold to the mold box with vaseline. 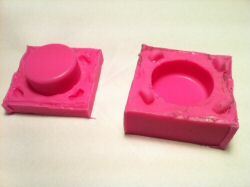 The finished squash / plug mold. The idea is you partially fill the base then squash the two halves together. The excess should squeeze out the sides and out the top air vents (which I forgot to put in). The squash mold in action. I made up some EasyCast resin and added some black pigment. 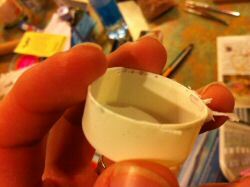 EasyCast may not be the ideal choice for the molds as it may not be rigid enough and it is hard to tint to a nice black. I ended up with a gray finish. 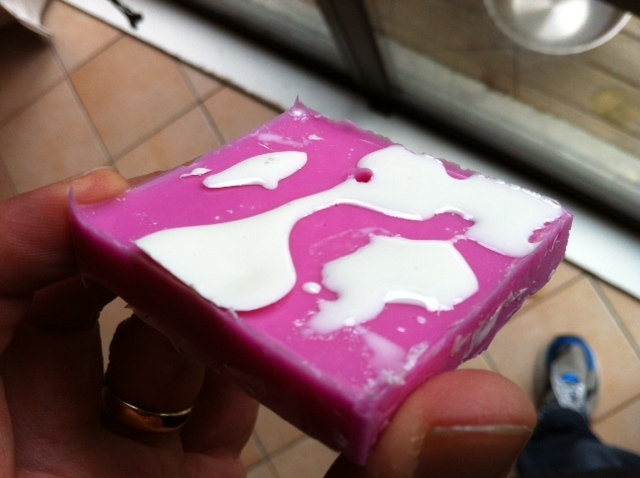 But it is very easy to mix and pour which is important for thin walled molds. I left this about 35 minutes to cure. 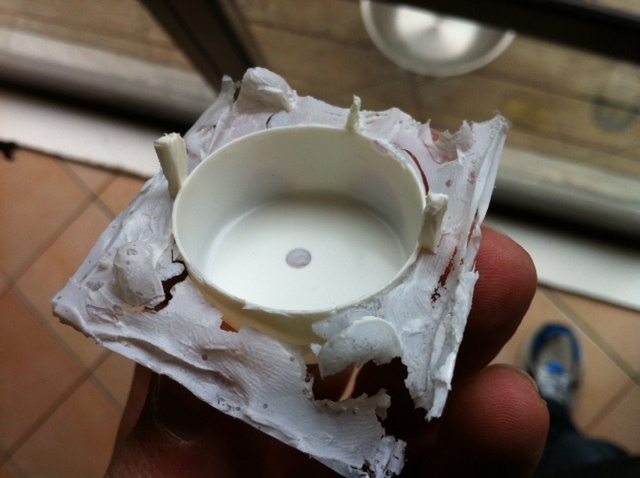 Easycast cures in about 15 mins, but thin sections actually take longer to set than fatter sections. You can see the basic shape is ok, but I have inconsistent coverage at the top. Some air vents would have helped there. The finished cast. The shape is good, although we have significant air holes. Ignore the flashing - that is supposed to be there with a plug mold, and it cuts off easily. The end result is too flexible although it stiffened up a little bit overnight. 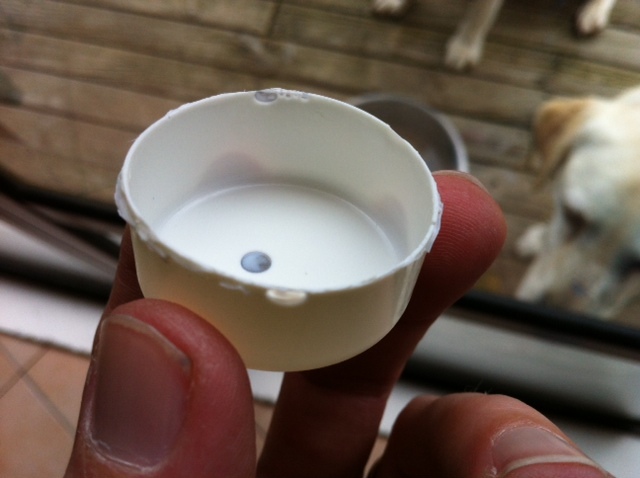 It will be interesting to see if the cartridge cases are stiff enough, or if I need to look at a different product. As I said, the walls on the soldering tin cast are only about 0.55mm thick, which is a lot thinner than the cart cases (thinnest case wall is approx 0.75mm, most walls 1.8mm to 2mm). I cut two missing air vents into the top of the mold and did another test cast. The second test was much better, with only a couple of air holes. 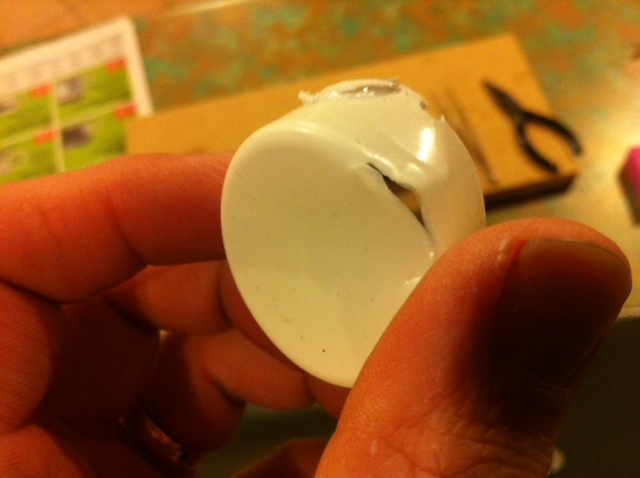 Ignore the flashing - that is supposed to be there with a plug mold, and it cuts off easily. the 3rd cast - AAAGGGHHH!!! So if two vents are good, then four is better, right? So I cut two more vents and tried again. This time the result was worse. MUCH worse. I need to figure out if that is due to poor placement of the extra vents or some other reason like not placing sufficient resin in the base of the mold before joining the halves together. 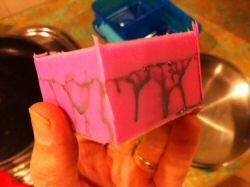 This time around I also tried to coat the top of the mold really well so I didn't put much in the bottom half. And I think that tear at the base is a giveaway there wasn't enough in the base. However there was plenty of resin coming up through the air holes so I thought I'd be ok.
Attempt #4: I mixed up extra resin, coated both the top and the bottom of the mold, gave the mold a good squeeze, and rotated the plug around a bit to squeeze all the air out, then bound it up tight with rubber bands. 5th cast - a solid B+ Finally!!!! So we present Attempt 5. I've finally got good coverage on the top edges of the pot. The air hole in the base is new, but I can work around that. Yay!